Cruising is not for me. Or so I thought. I was convinced cruise ships were the equivalent of five star resorts on land. A place you go to be served and pampered – and equipped with blinkers for what goes on in the outside world. I also had vivid images of people stuffing themselves with too much food, drinking too much wine, and generally acting as ignorant as only a certain type of tourists do. Much to my surprise, I was invited along on a press trip by the Azamara Cruise group. And even more surprisingly, I accepted. People that know me, had a hard time believing it when I said I was going on a cruise… but after all, you don’t turn down an invitation to cruise the Med for one week, all expenses paid, right? 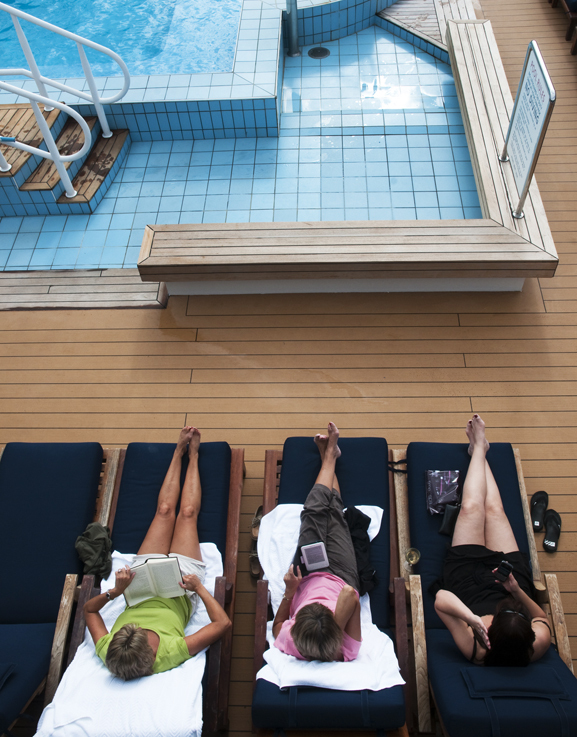 To my relief, Azamara believes in a casual approach to cruising. There’s no formal dress code, and the staff are as delightful as they are top notch. Waitress: Would you like some more wine, ma’am? Me: No thanks (it was lunch time and I was planning a run on the treadmill in the afternoon). Waitress: Why? Are you going to drive? Waitress: Go on then. Enjoy yourself! 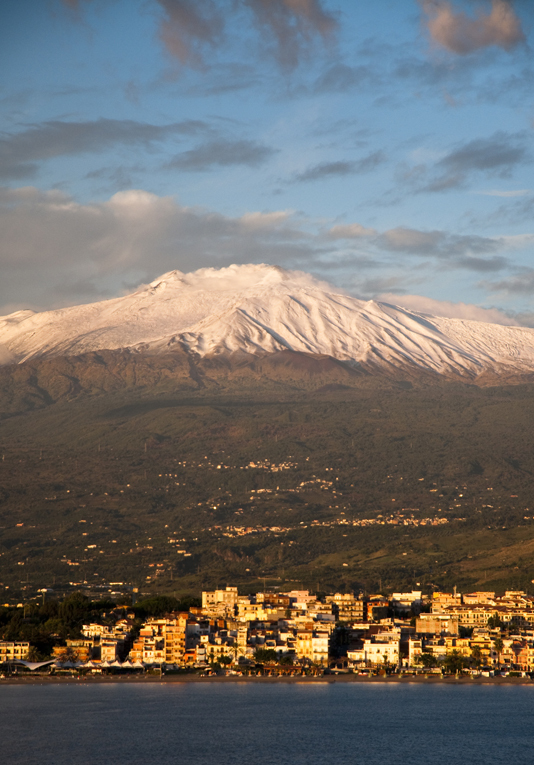 I spent seven days aboard the Azamara Quest, and I can honestly say they were the most relaxing days of my life! No exaggeration. I did my fair bit of sightseeing when we were docked, and I did stop by their fitness room almost every day. But still, it was such a smooth, relaxing way to travel that I would easily do it again. In fact, I’m off on a journey with the Norwegian Epic this May. And who knows, maybe I will just have to become a travel writer specializing in cruises from now on! Not a bad place to wake up! The majority of my fellow cruisers were in fact pensioners, however, some couples in their early thirties were on honeymoon and quite a few couples in their 40’s were just enjoying time off. 2 – You end up in a great big line whenever you want to eat or get off the ship. As a traveler being used to exploring to my heart’s content, traveling on a cruise ship can quite easily let you down. You are always on a time limit, and you will have to settle for exploring the places dictated by the itinerary. In other words, don’t expect to unleash your inner adventurer. On the other hand, you are free to explore during the hours the ship is docked, and whether you decide to follow the footsteps of the masses, or go off on a mission of your own, is totally up to you. 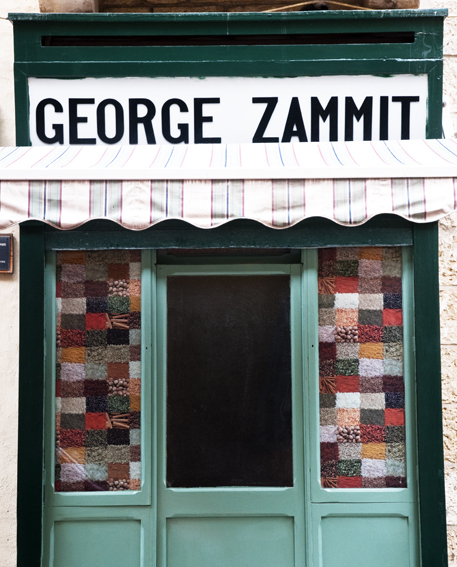 The cutest little, Italian shoe shop. 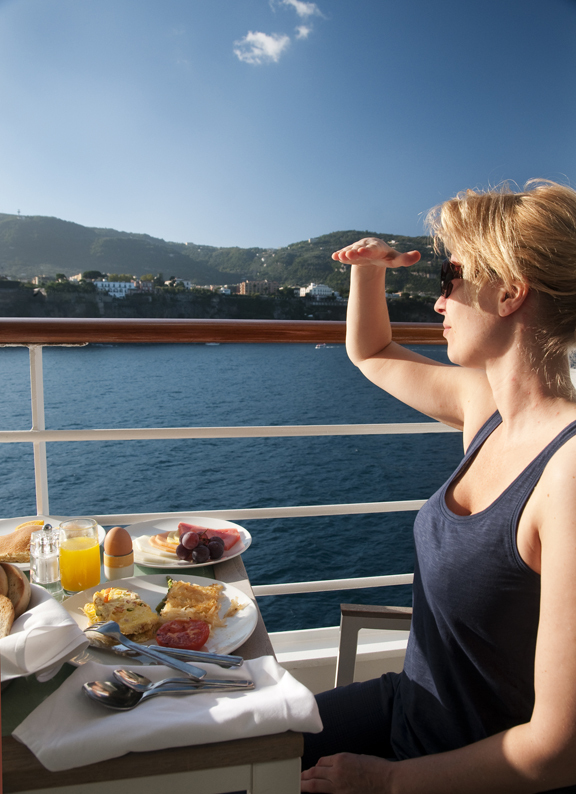 Here is one of the articles written about how cruising is so me now! 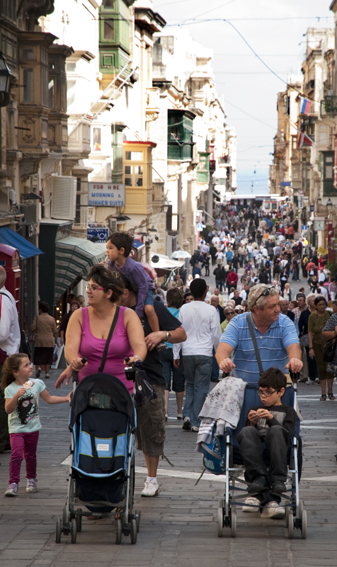 A Maltese mother offers her toddler a bottle of water in the middle of Valletta’s high street. She’s communicating in fluent English, a linguistic heritage from back when Malta was British (they achieved independence in 1964). Five minutes later I overhear a conversation between two young shop attendants at fashion shop ‘Bershka’. They are talking in a language that sounds totally alien to me. A very pretty language, but nonetheless incomprehensible – with a different ring to it than anything I’ve ever heard before. Maltese it turns out. 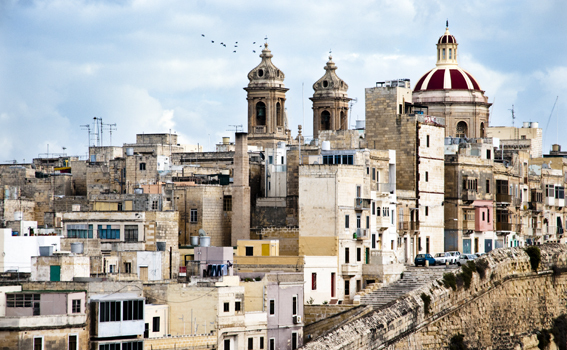 Valletta. Beautiful from the outside, and interesting once you start prying into her back alleys. 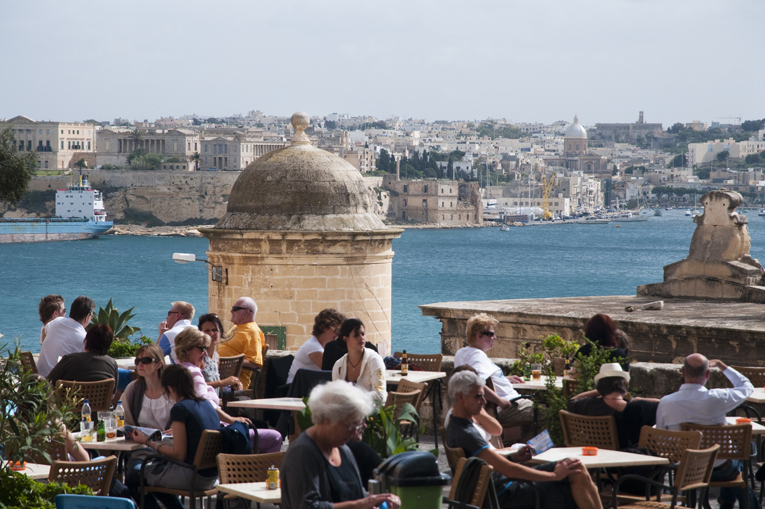 Hearing the Maltese talk is one way of understanding that Malta is quite a different place. 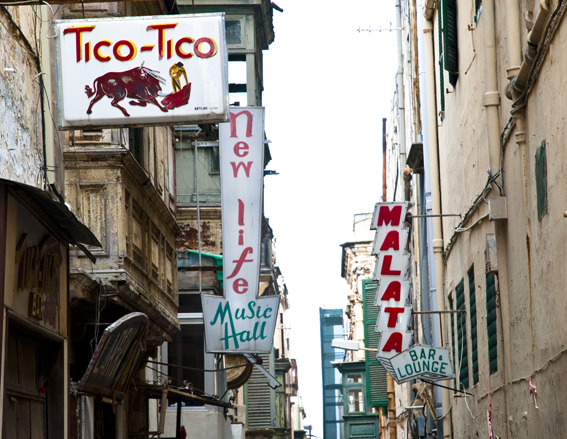 Another way to approach and appreciate Malta’s multi cultural past is by taking a stroll down Valletta’s back alleys and do a sign safari. A sign safari? I hear you say. Well, it’s one of those things you end up doing when a myriad of type faces, a wide variety of shapes and sizes and faded colors alongside vivid neon grab your attention wherever you turn your head. Most of all however, it is the exotic names that speak to me. To me, it looked like a film still. Who would have thought this company is still going strong? Below are more signs. Mostly because I found them charming, but also because they have stories to tell. About a bakery (pastizzeria) where loose change is enough to buy you the Maltese specialty called pastizzi (small pastry parcels filled with a sweet or savoury filling) . About a barber who ran out of clients. And about a watch maker who lost his eye sight. 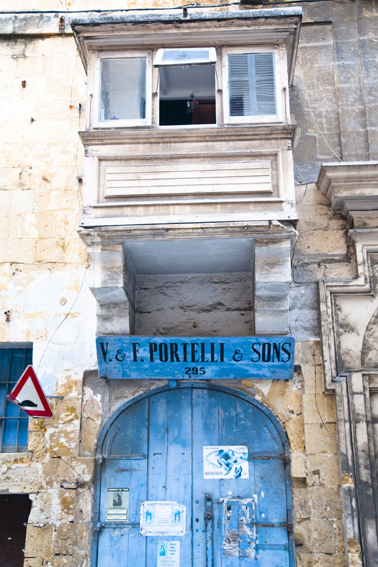 Valletta's old shop fronts display an insight into linguistic as well as colonial history.